CONCORD – Visit North Carolina have announced that domestic visitors to and within Cabarrus County spent a record $400.03 million in 2014. Cabarrus County saw the second highest percent increase in visitor spending behind Orange County, outpacing North Carolina and 98 other counties. Cabarrus County lodging experienced a 12% increase in room demand in 2014. The driving force? A dynamic tourism product. Value and exclusive offerings at Charlotte Motor Speedway continue to draw dedicated race fans to the 1.5-mile superspeedway, zMAX Dragway and The Dirt Track. The venue also played host to the Mustang 50th Birthday Celebration in 2014, generating over $8 million in economic impact in Cabarrus County. 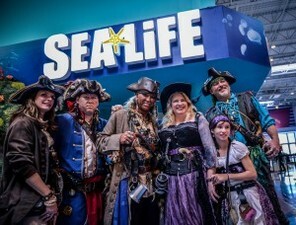 Also new in 2014, SEA LIFE Aquarium joined an ever-fresh mix of attractions and retailers at Concord Mills luring even more leisure travelers to the area. Combined with the year-round appeal of Great Wolf Lodge and NASCAR team race shops, Cabarrus County is a destination with a distinct culture that has something for everyone. Lodging options complete a well-rounded mix of offerings in Cabarrus County. Amenities abound for groups hosting meetings and conventions at Embassy Suites Charlotte-Concord and Great Wolf Lodge while convenience and easy accessibility along Interstate 85 are attractive to both individual corporate and leisure travelers. Tourism is economic development. Learn more about how visitors positively impact our community and the role of the Cabarrus County Convention and Visitors Bureau. These statistics are from the “2014 Economic Impact of Travel on North Carolina Counties.” The study was prepared for Visit North Carolina by the U.S. Travel Association. Click here for more information about the travel impact numbers.